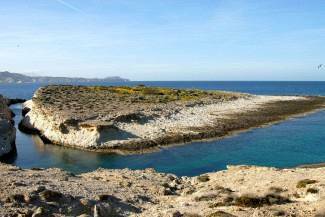 This is a route through one of Milos’ most impressive landscapes ideal for hiking. It’s about 4.5km long, with the seaside village of Aghios Konstantinos (where you can go by bus) as the starting point and the end point in Sarakiniko (where there is also a bus stop). The path is not always easy to make out, but you should have no problem because the route is parallel to the coast, along accessible flat rocks. The Miloterranean signposts are unobtrusive and come only at a few key points, so as not to detract from the unique beauty of the landscape. The village of Aghios Konstantinos, a dozen houses and their corresponding “syrmata” (enclosed areas where fishermen haul up their boats out of the reach of the waves) is built in a nook where the land forms a small fjord and offers protection from the weather. On the southern edge of the village a cross rises out of the rocks, and underneath, dug into the soft rock, is the little chapel of Aghios Konstantinos (P1). It belongs to the famous “rock-cuts” of the island, the characteristic cave-like structures carved into the soft pumice tuff. The chapel is very old, but its exact age is unknown, as tradition has preserved only that it was dedicated to St. Constantine. 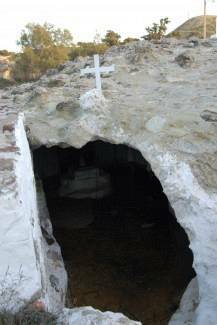 The earliest historical reference to Aghios Konstantinos is from 1843, while another source refers to the difficulty of detecting it, because of its underground construction. Located near the sea, it is entered through a narrow opening with two steps. Inside, a natural rock “bench” has been left that apparently served as a seat. A very small sanctuary enclosing a Holy Altar has been carved using the same technique, along with two niches flanking the entrance to the sanctuary. In the middle of the chapel there is a little natural spring, from which gushes “a most delicious water” considered by many to be holy water. In 1891 a private party constructed a small chapel and a “cell”, also dedicated to St. Constantine, in a conspicuous location about 60 m further west. Near Aghios Konstantinos may also be found the church of Aghios Sozon, built in 1930. The geological interest of this route starts right in Aghios Konstantinos. Just before the churches, the maroon-colored layer in front of you is paleosol overlying a formation consisting of pumice flows. On the east side of the bay is a clear sequence of layered pumice tuffs on top of which sits a “lahar”, i.e. a deposit of volcanic and metamorphic rocks in the form of loose, heterogeneous materials such as gravel (small stones).To begin your hike in earnest, take the dirt road that descends to the beach 200 m west of the settlement. On the sand dunes that fringe the beach at Aghios Konstantinos grow plants such as cottonweed (Otanthus maritimus), sea spurge (Euphorbia paralias), and couch-grass (Elymus farctus). The residents have also planted tamarisks (Tamarix sp) for protection from the hot sun. Walk along the beach, and when you reach the western end, you may observe typical beachrocks, formed by the bonding of hard rock fragments by natural mineral “glue” found in areas where fresh and salt water mix. Along the rocky coastline, phrygana vegetation becomes prevalent and plants such as heather (Erica manipuliflora) kidney vetch (Anthyllis hermanniae), felty germander (Teucrium polium) and statice (Limonium sp.) are dominant. Such is the effect of the sea wind on all the plants of the rocky coast that the vegetation starts from the point reached by the spray from the bursting winter waves. About 200 m past the beach of Aghios Konstantinos, the second small promontory you come to is separated by a fissure from the body of Milos. This small island, called Kofto (“cut off”) (P2) by the locals, is home to a small colony of Capsian gulls (Larus cachinnans). The rocks along this coast are derived exclusively from pumice ash flows. You are walking on irregular pieces of pale pumice from a few centimeters to over 1 m in size, bound to an elaborate, glassy pumice mass. These soft white rocks have two “systems” of fractures in a NNE-SSW direction which are crossed by others in a NW-SE direction. The islet was cut off from the shore because of the combination of these fractures. These pumice flows dominate as far as the settlement of Mytakas. Continuing westwards, you come to the sandy beach of Mytakas. Here, on the dunes, besides the other plants you have already seen so far, scattered sea daffodils (Pancratium maritimum) are prevalent. Leaving this beach you proceed on tuffs with the same kind of phrygana, only now you begin to see scattered, usually young maritime junipers (Juniperus macrocarpa). All the small beaches on your way to Sarakiniko, accessible from the coast, support glasswort (Salicornia europaea). The rocks on which you are walking are formations from coastal depositions, usually with loose pebbles and sand. Throughout this part of the coast, and as far as the settlement of Mandrakia (to the west, beyond this route), white diatomite (a mineral of organic origin) and pumice tuffs of great extent and thickness dominate, alternating with greyish-white pumice tuffs and pale yellow limestone benches. All the way from the beach at Mytakas to the beach at Sarakiniko you will see multiple appearances of tuffs, which often alternate with layers of fine-grained rock of a sugary texture (in which you may notice fossils, mostly of bivalves and echinoids), and pumice-rich layers in thick or thin deposits. In the first (fine-grained) layers there are often trace fossils of burrows in the form of tubes for excavation, habitation, and food gathering from bottom-dwelling organisms that have been filled with fine material and now appear as irregular cylinders of considerable size (up to 10-20 cm in length and 2-3 cm in diameter) that emerge in modern surface erosion. In at least two instances (one in Sarakiniko), the fine-grained layers exhibit a chaotic ordering that gives the impression of “twisting” (a geological term for “a fossilized earthquake”). This indicates that this layer was disturbed by an earthquake before solidifying. Above this sequence are porous formations in various colors, reddish, yellowish or brown, containing altered and unaltered volcanic materials (fragments of lava, obsidian, shale, and milky quartz) in a sandstone-like porous mass. All the rocks of this particular area (P3) are rich in fossils of marine organisms (molluscs, gastropods, crustaceans, fish, sea urchins, bivalves of the terebratula genus). Certain kinds of burrows in the old sea bottom and other trace fossils are evident in both the diatomite and throughout the stratigraphic column of the Plio-Pleistocene era. The total thickness of the diatomite exceeds 100 m, as do the pumice tuffs as well. The phase of diatomite deposition, based on the micropalaeontology of their content, reflects a fairly deep marine environment. As far as Sarakiniko, the sequence of layers is the same: alternating diatomite, pumice tuffs, and yellowish fossil-bearing limestones. A departure from this pattern is found in a brown/earthy stratum with a thickness of a few centimeters to a few meters. This stratum is almost horizontal. It is geologically recent and consists of a layer of paleosols, which contains white, fossilized roots. The organic material has been replaced by fine-grained calcite. The roots are up to 5-7 cm thick and visible to a length of 1 m (P4). 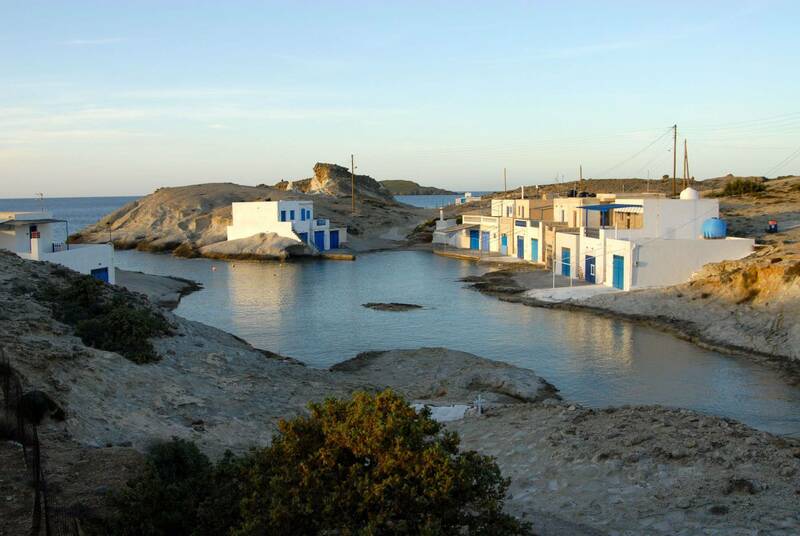 Arriving at Sarakiniko, you will see one of the most characteristic landscapes of Milos’ north coast. The bone white rocks of volcanic origin that form large and small caves in the sea reflect the sunlight by day and the moonlight at night, creating the impression of a lunar landscape. The natural bay with a small beach at the cove offers a respite to the eye from the blinding whiteness of the landscape, intensified by the lack of green nearby. Sarakiniko probably owes its name to the Saracen pirates who ravaged the Aegean, but we have no information about Saracen pirates at Sarakiniko. The rainwater flowing into the gorge and heading towards the sea between soft white rocks has carved out the stream bed in a striking fashion. The complex shapes formed by water erosion are an enjoyable attraction for those who decide to descend on foot, though often with some difficulty, into the small ravine. It is the hidden beauty of Sarakiniko that sailors from the French battleship “Gaulois” of the English-French Fleet, which anchored at Milos during the First World War, praised. For this reason they baptized this area the “Plage Gaulois”. 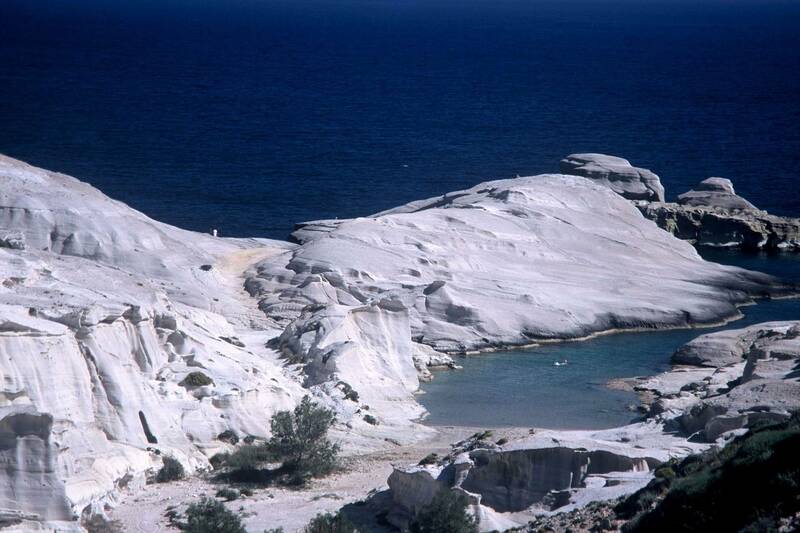 The white of the land and the blue of the sea combine harmoniously in a unique geological setting of otherworldly beauty, adorning Milos with another natural treasure. From the shore at Sarakiniko, go up the path that heads south to the parking area and the bus stop in order to return to your base.